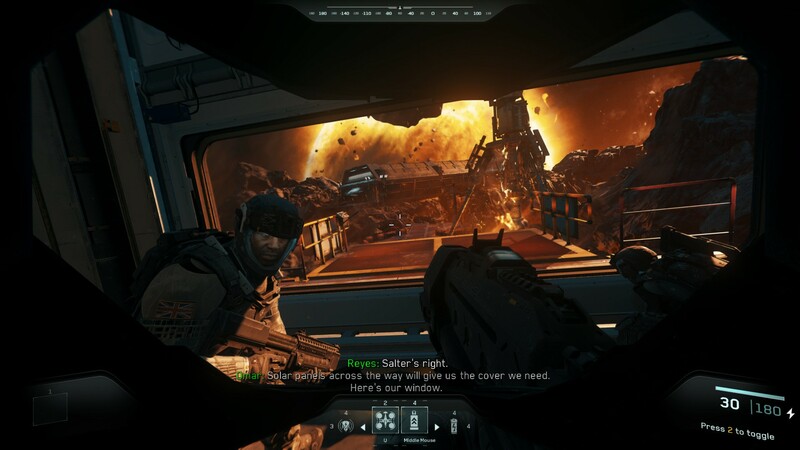 There’s an awful lot of Call of Duty out right now, what with Infinity Ward offering up a remastered version of their runaway success in Call of Duty: Modern Warfare, and with a more modern take on the series, Infinite Warfare. 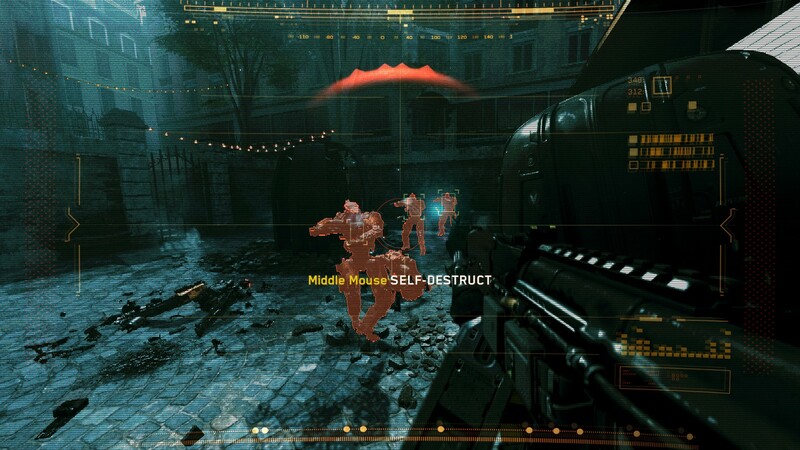 There’s also a take on the Zombies formula, typically Treyarch’s domain, and plenty more content set to come out with the season pass, and filling out the maps in Modern Warfare Remastered’s multiplayer. So, is the sum of the package greater than the parts, or are certain elements worth playing over others? It’s clear that at the very least, some thought has gone into crafting the Legacy Edition package, which nets you both full experiences. Much like an amateur carpenter however, the construction is misshapen, the finish is poor, and some elements are far and away better than others. 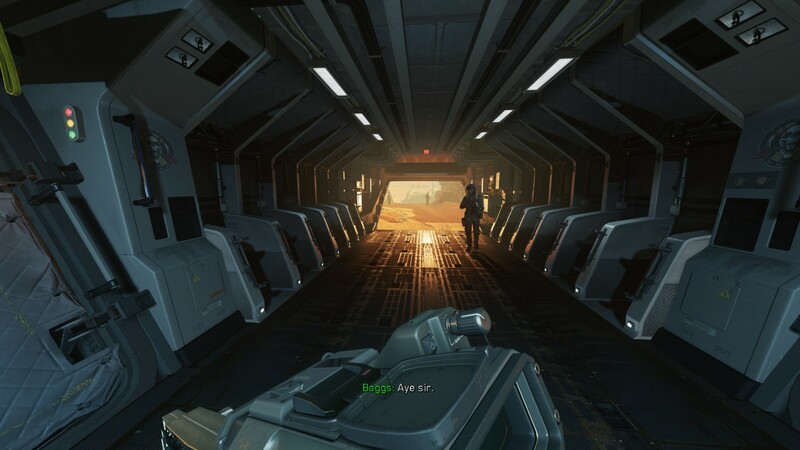 Let’s start with the larger of the two halves, Infinite Warfare. Come closer bro, I want you to see my high-poly face in all its glory. 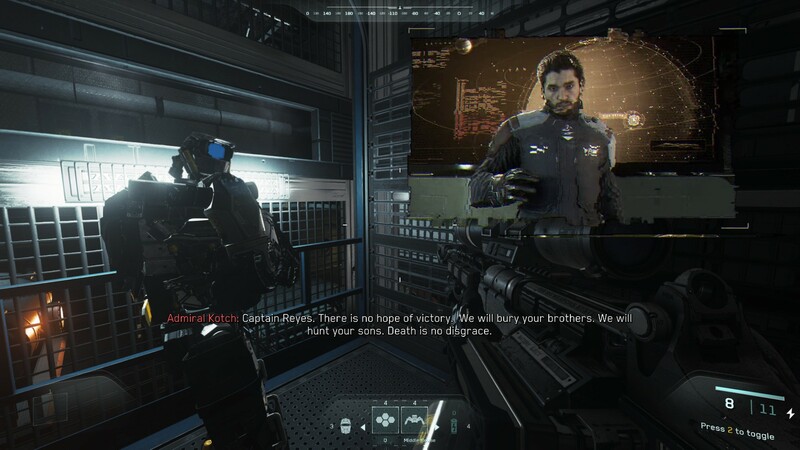 Written off by much of the gaming populace before it even made it to market, Infinite Warfare centers on a conflict between the Settlement Defense Front (SDF), a hilariously militaristic rebel group born out of Mars and its struggle for independence, and the remnants of the United Nations Space Alliance (UNSA), an Earth-based league of spacefaring nations. The single-player details the struggles of one Captain Reyes, as he attempts to lead the UNSA in a war against the SDF, after the latter’s devastating attack on the UNSA fleet. 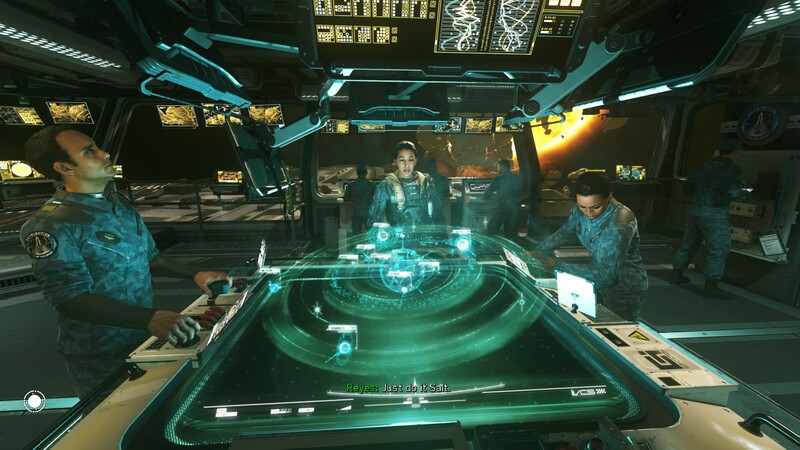 Differing from previous Call of Duty installments, Infinite Warfare gives the players numerous side missions to take part in, on top of the overall story arc. 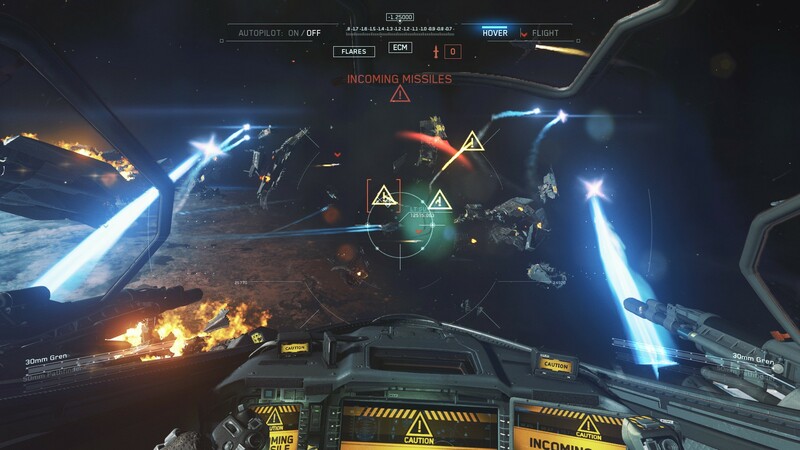 While the main missions seem designed to funnel players through an endless series of hallways and corridors across multiple planets, the side missions involve space dogfights, stealthy assassinations, infantry combat in the vacuum of space, and more. Though these missions have little bearing on the overall plot, they do allow access to some new upgrades for your fighter, and unlock more weapons and attachments for your use. More importantly, they break up the gameplay of the main story, which is sorely needed at times. As far as the actual plot is concerned, the main missions, of which there are relatively few, will run the course of five to six hours. 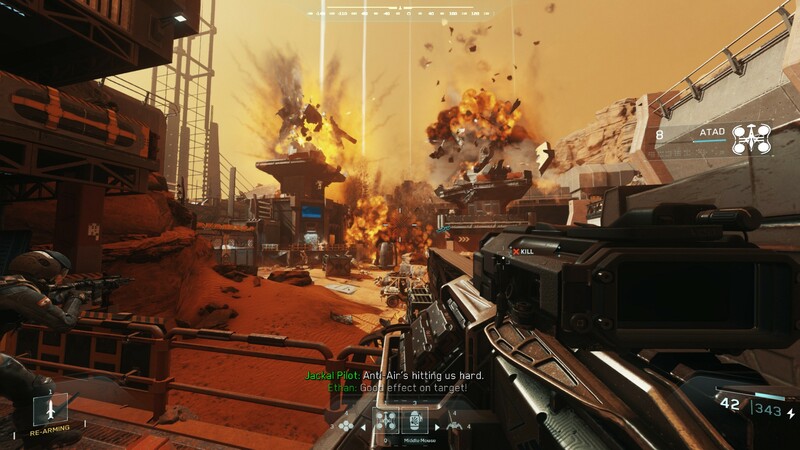 In the course of the campaign, per usual Call of Duty fare, the explosions ramp up, but so does the sheer ridiculous nature of the missions, taking you from a few light incursions to rescuing scientists and miners from an asteroid on a collision course with the sun, culminating in a final assault on the SDF’s Mars stronghold. 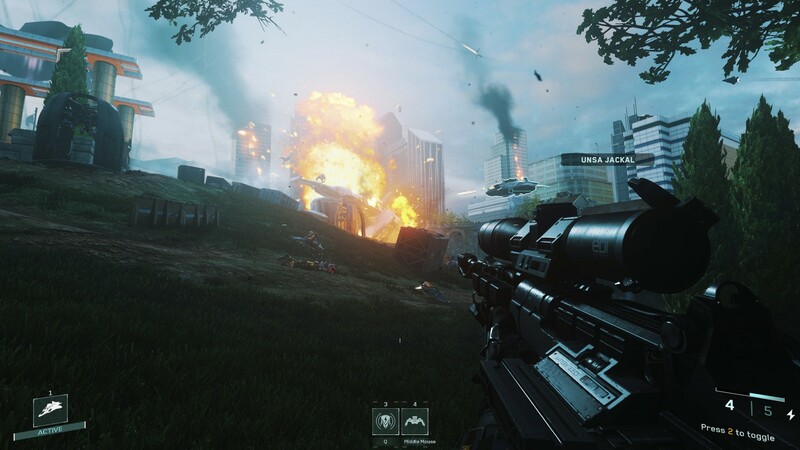 Throughout the game, there’s a pervasive sense of soldiers sacrificing themselves for the greater good, for either the lives of their fellow marines or perhaps the livelihood of all the Earth-born. But with the body count reaching a crescendo, the ultimate victory achieved is pyrrhic in nature, and we’re left wondering who really the victor of the war was. Both the UNSA and the SDF have been almost entirely obliterated, and both sides’ sacrifices may have ultimately been in vain. 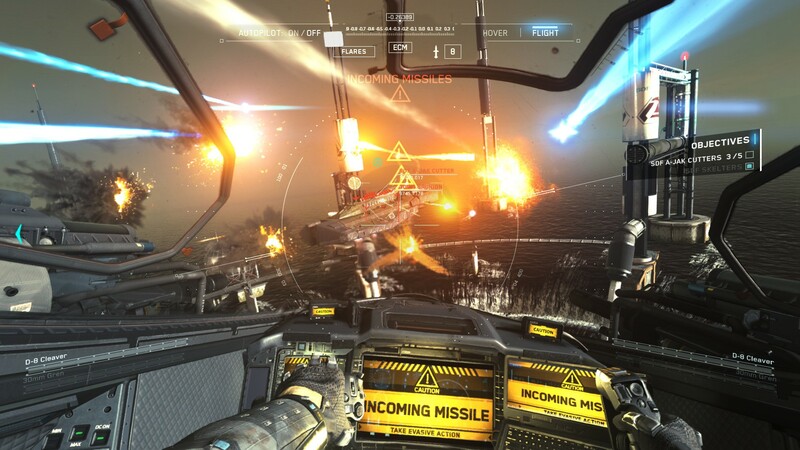 Instead of glorifying war and combat, Infinite Warfare seems to suggest that the sheer destruction and sacrifice brought about by conflict may not be worth the cost of human lives. It is a welcome change for the series, and definitely one of the best stories told by the franchise in years. In this regard, I’m reminded of Killzone, and not necessarily in a good way. 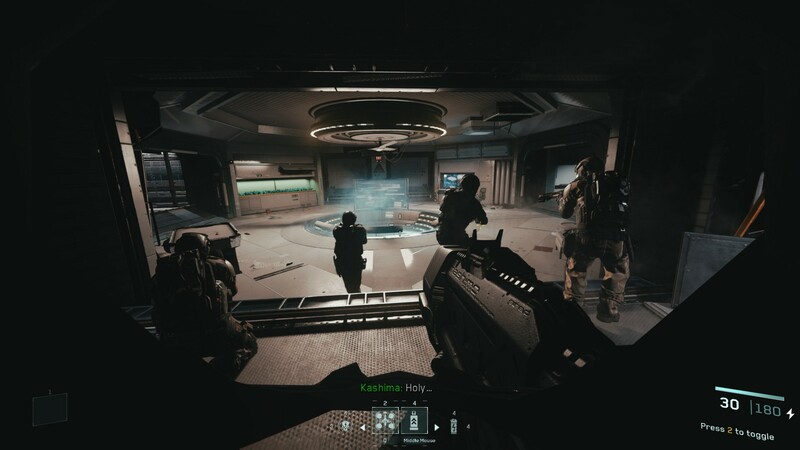 Numerous comparisons between the Helghan Empire and the Nazis of World War 2 shooters were quite applicable, and it seems as though Infinity Ward is aiming for a similar comparison with the SDF in Infinite Warfare. Players don’t have to feel bad about gunning down thousands of SDF soldiers, or breaking faceplates in the vacuum of space, or any number of morally questionable methods of murder, because the SDF is universally evil. 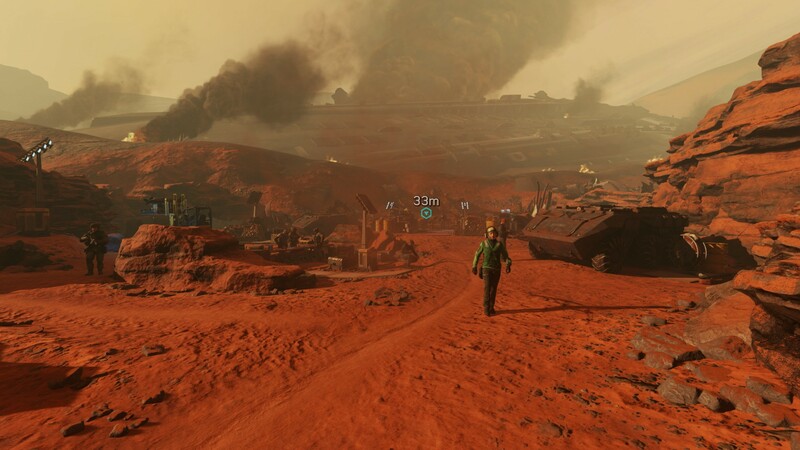 Mars has a vicious climate. 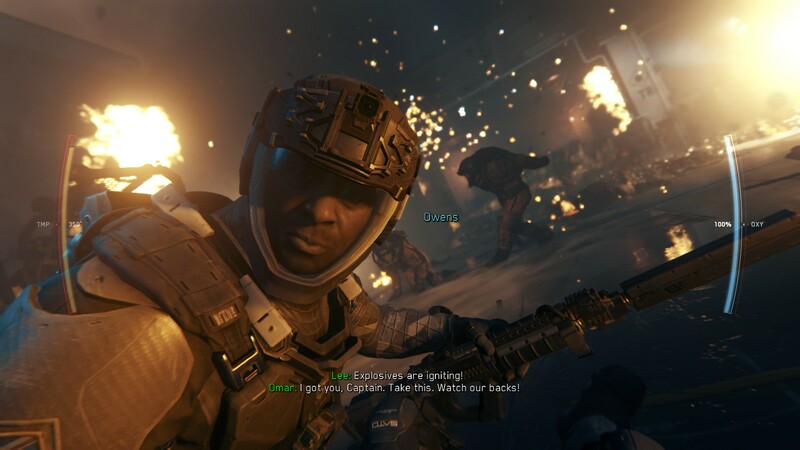 Regardless of the inherent qualities of your foes, the story, writing and voice acting definitely deserve recognition over the abysmal mess that was Black Ops 3. 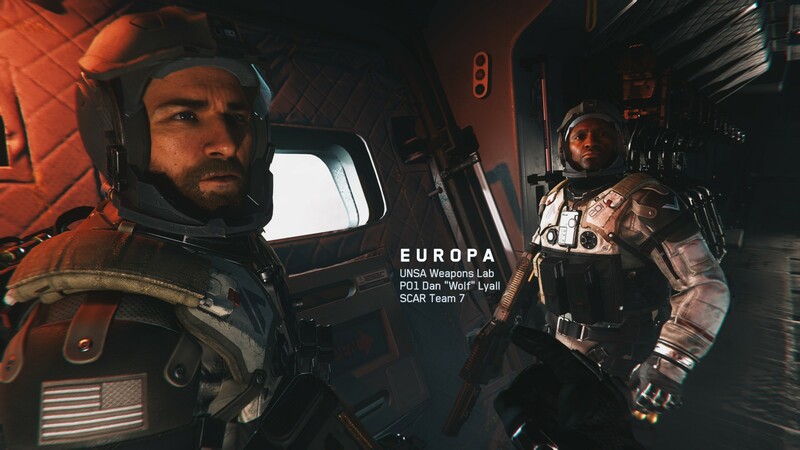 Reyes and Salter, his longtime wingwoman, give off an 80s buddy-cop vibe, and with the wisecracking E3N (Ethan) at their backs, while the characters are nothing new, they’re executed with a level of polish that seemingly only Call of Duty can achieve. 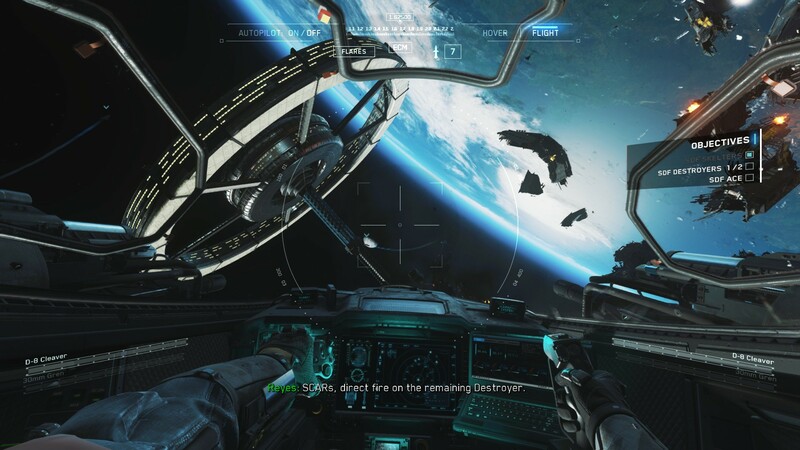 At the end of the day, the story is at worst coherent, its characters tolerable, but the execution and variety of gameplay make Infinite Warfare a breath of fresh air to play, over the tepid stories found in previous titles. 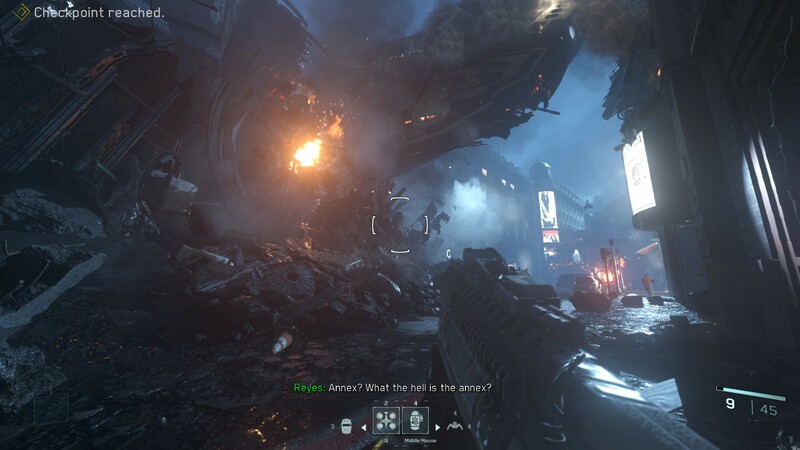 Briefly, Infinity Ward’s take on Zombies sees four 80s movie stereotypes teleported into a movie set, as they blast off the heads of parachute pants-wearing zombies in a stylish theme park. The entire mode is drenched in a neon-green slime of horror B-movies, and the nonstop quips and one-liners make this iteration of Zombies much more approachable than previous outings. Sure, there’s a whole glut of secrets and Easter Eggs to find, but it’s stylish, it’s hilarious, and, again, it’s coherent, compared to the end of the Black Ops Zombies cycle. But most people don’t play Call of Duty games for the single-player. Some play it for Zombies, yes, but the biggest draw of the series is by far the competitive multiplayer. Before we get into the multiplayer proper, it’s worth noting just what Infinity Ward failed to do with the movement system present. 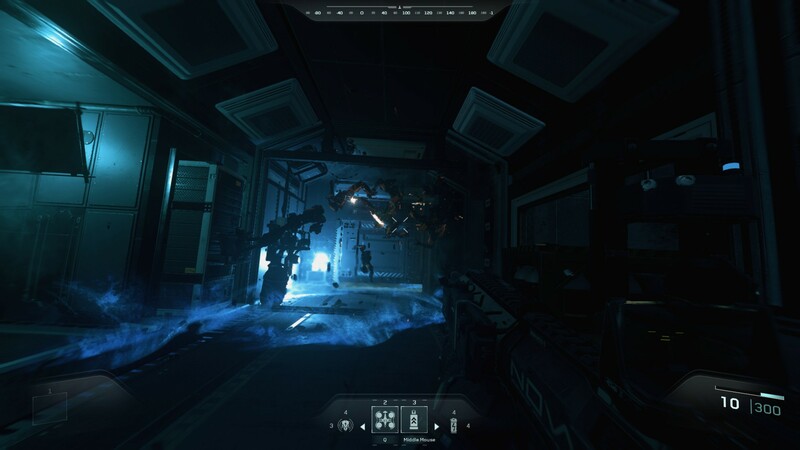 First introduced in Advanced Warfare, Infinite Warfare’s level design in both multiplayer and single player fail to take any meaningful advantage of the wall-running and boost-jumping capabilities. 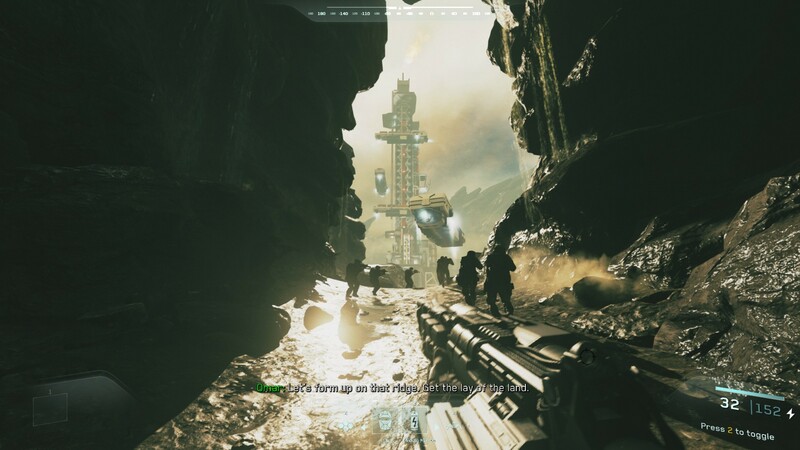 I’m certainly not asking for a rehash of Titanfall 2, but there are so few opportunities to wall-run and double jump that I’m left wondering if it wasn’t a last-minute addition to Infinite Warfare. From Black Ops 2’s flight to this. 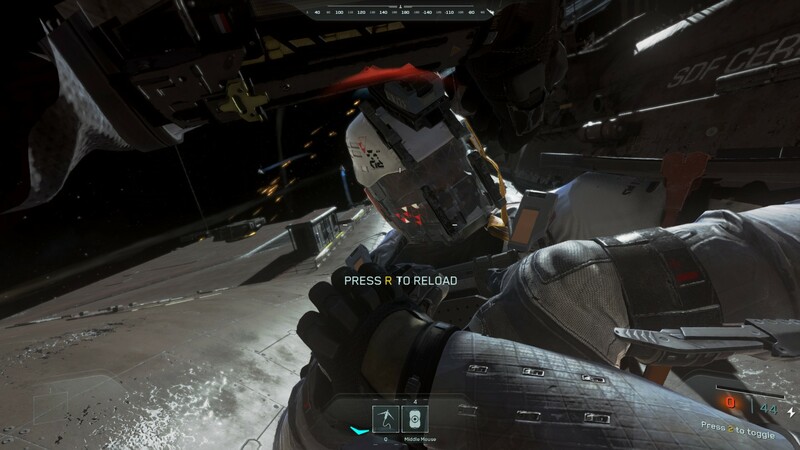 Continuing on, succinctly, Infinite Warfare’s multiplayer is the most creative guns seen in the series wrapped in a package of downright awful maps and collection systems. 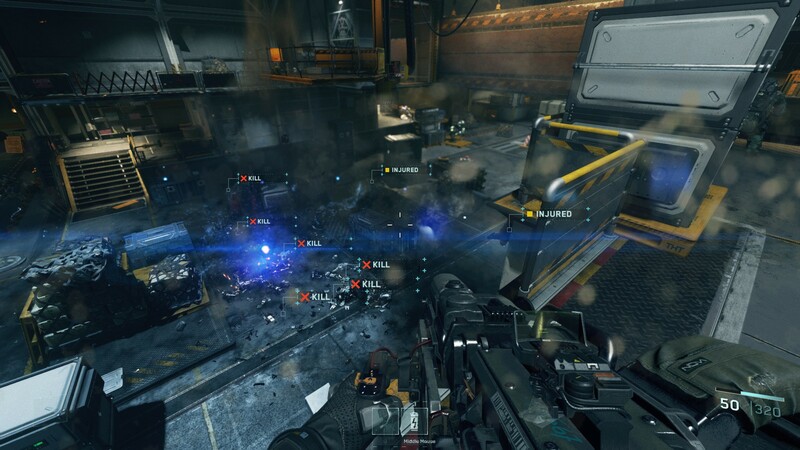 For brief examples, Infinite Warfare features an assault rifle that can be split into akimbo pistols, an SMG that can transition to an assault rifle and back, a laser LMG that gets more accurate the longer it fires, laser shotguns, gravity grenades, flying grenade drones, cryogenic mines, and more. 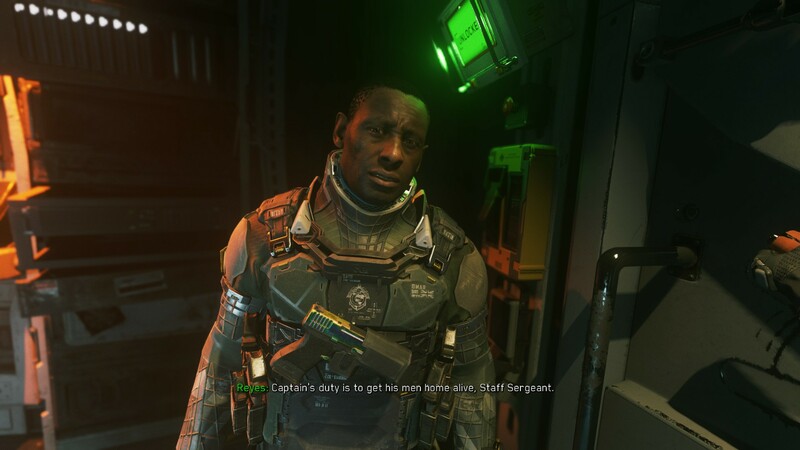 It’s original, exciting, and goofy: what Call of Duty might have needed for a new game. The maps and progression, however, are another story. 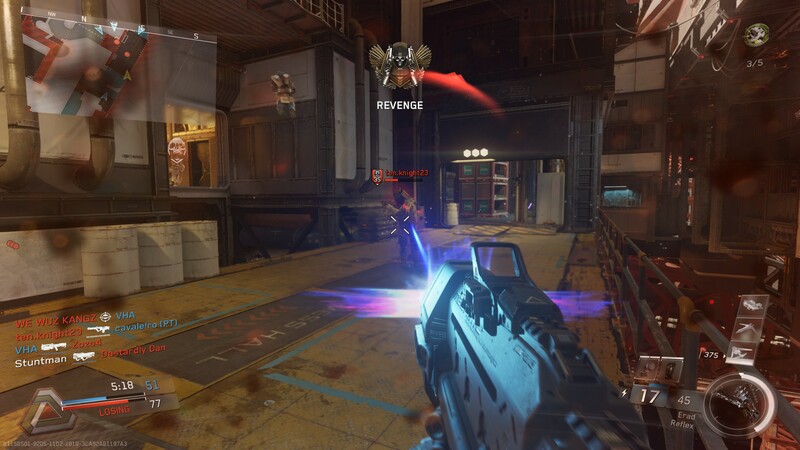 Basic Call of Duty map theory boils down to there being three distinct “lanes” of travel with chokepoints scattered throughout the map, where gunfights are supposed to happen. Never before has this been more obvious, and with the failure to adequately utilize the movement systems, never before has it made the maps duller. 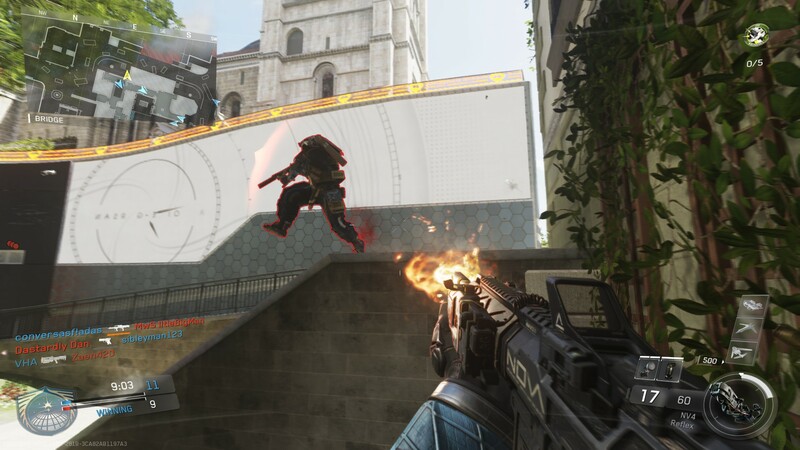 Black Ops 3 avoids these trappings by making it easy to chain together wall runs and the double jumps giving a fair amount of height, ensuring that Treyarch could develop maps with some verticality. 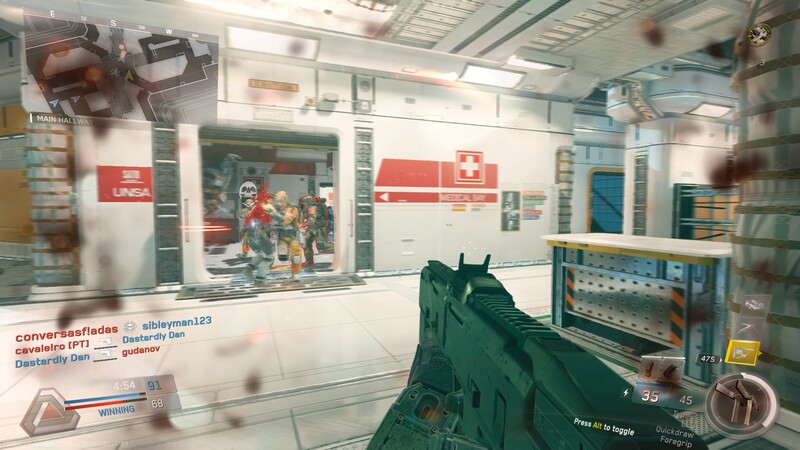 Infinite Warfare makes it seem as though your jetpack is blasting out molasses, and your boots covered in very tacky tape, with almost every map existing on a flat plane. Perhaps this wouldn’t be a problem if players had some survivability in Infinite Warfare. 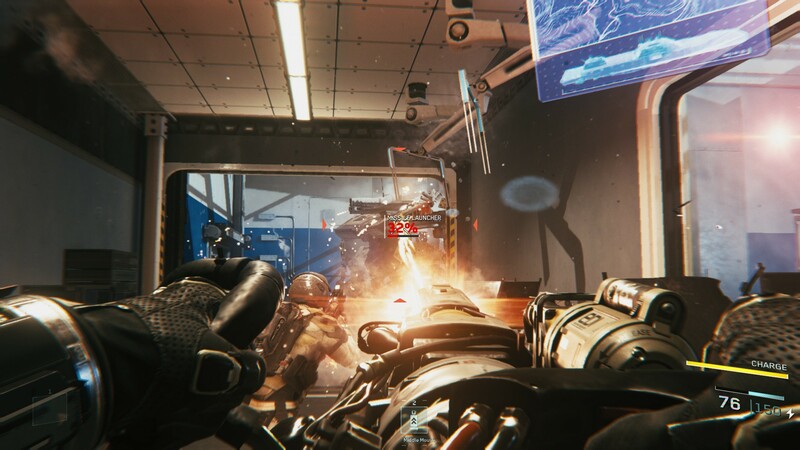 Maybe I’m just getting older, but I struggled to stay alive for any meaningful length of time, and found it harder to chain together killstreaks in Infinite Warfare than in previous entries, because everyone dies so often, so frequently. 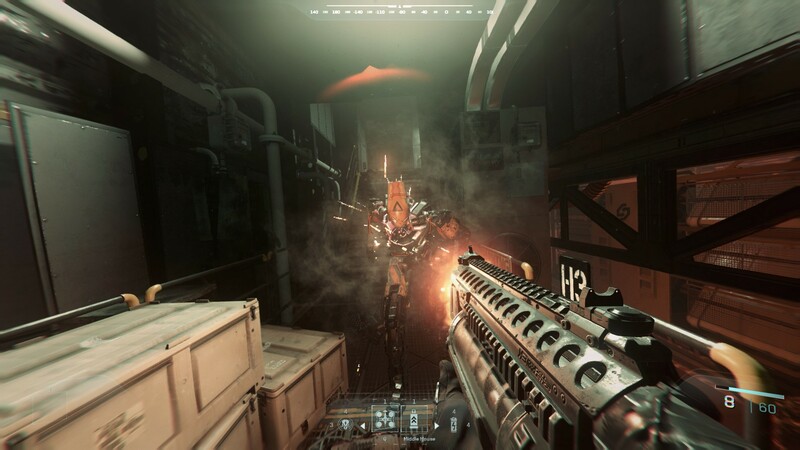 Either guns of the future do more damage, or the “rigs” are made out of glass, it seems. Kills rack up very quickly, and matches seem to be over in the blink of an eye. 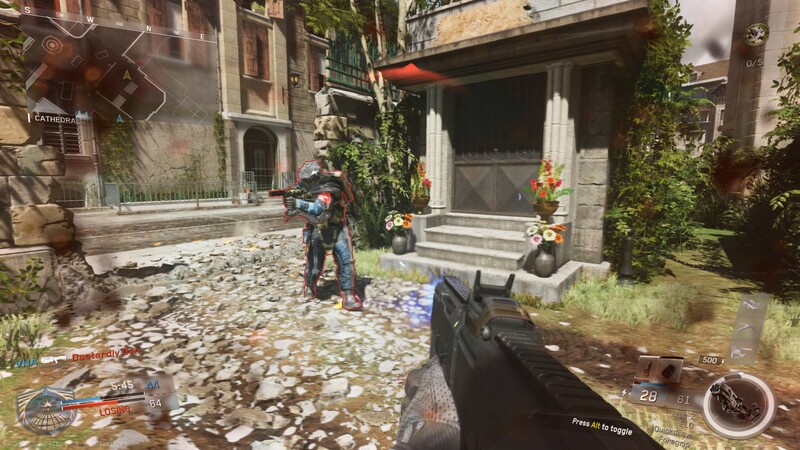 Speaking of the rigs, Infinity Ward stepped away from the campy nature of Black Ops 3’s specialists, replacing them with faceless space marines, losing much of their personality and customization in the process. 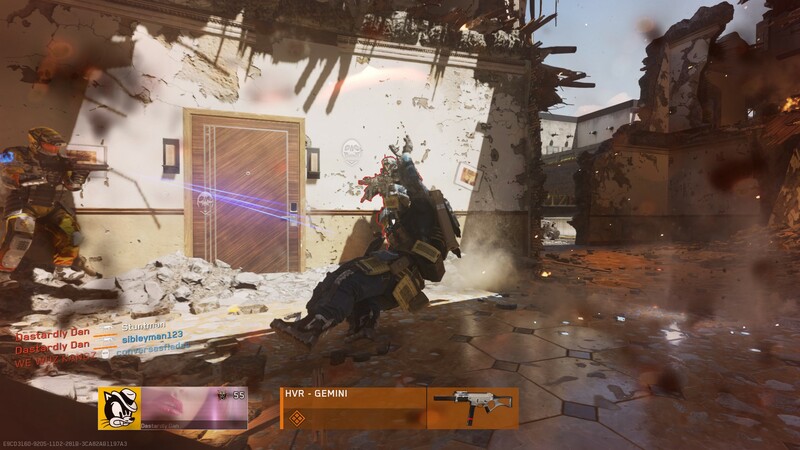 Sure, Black Ops 3 may look like a kaleidoscope of clashing colors, but the characters had personality. Infinite Warfare lacks this same charm, and it’s hard to tell why. Maybe it’s the serious nature of the plot, or perhaps the desire to have a consistent aesthetic between rigs. We’ll likely never know why. 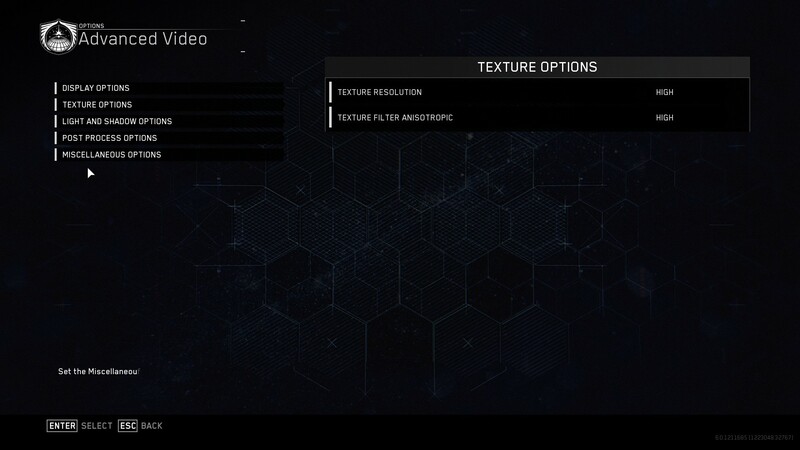 Outside of multiplayer features, some key systems from previous games are simply missing. Leaderboards for various stats, a full-featured emblem editor, combat stats and match history, these are all simply not here. Insultingly, leaderboards are locked, with a “coming soon” sign placed in front of them. Almost three months on from release, and no one in the community has any idea when we’re getting them. 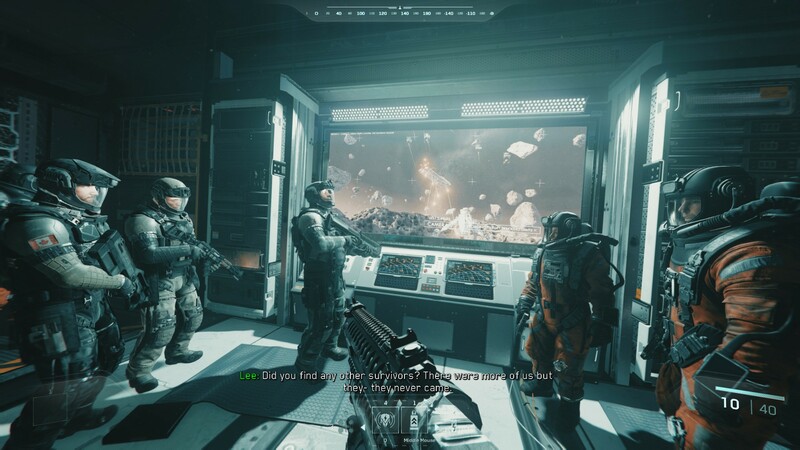 Finally, the multiplayer in Infinite Warfare is undoubtedly plagued by the worst implementation of the “loot crate” system found in so many games these days. The primary in-game currency (keys) seems to be a full-time grind to acquire any meaningful amount, and with no way to see what you’ve unlocked, either recently, or an easy way to see overall, you’re going to be opening a lot of low rarity cases to unlock ugly camoflauges for guns. There is a way to unlock perk-bestowing gun variants, but some of the best variants are only found in crates, and this secondary currency system (salvage) takes even longer to earn. 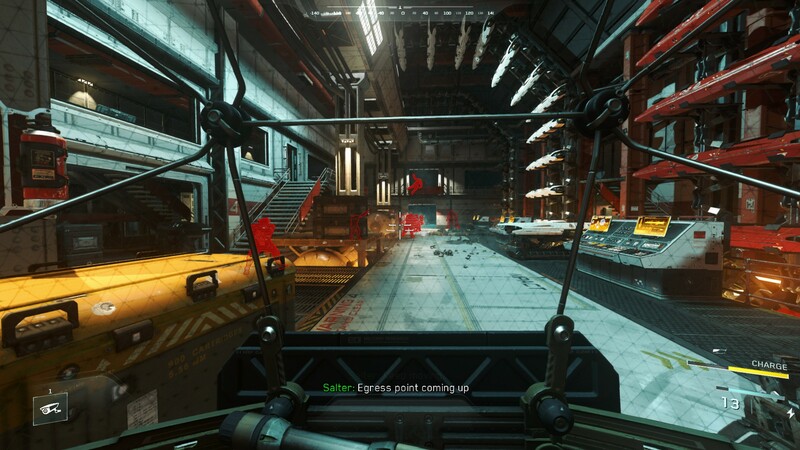 Infinite Warfare does run quite well, and looks even better, despite its age. 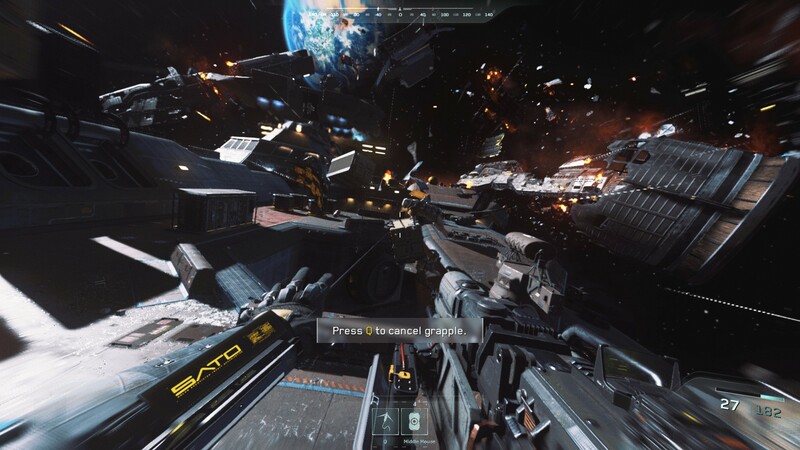 Whereas Black Ops 3 struggles to rise above a filter that muddies everything on lower textures and resolutions, Infinite Warfare does still look good, even on aging hardware. 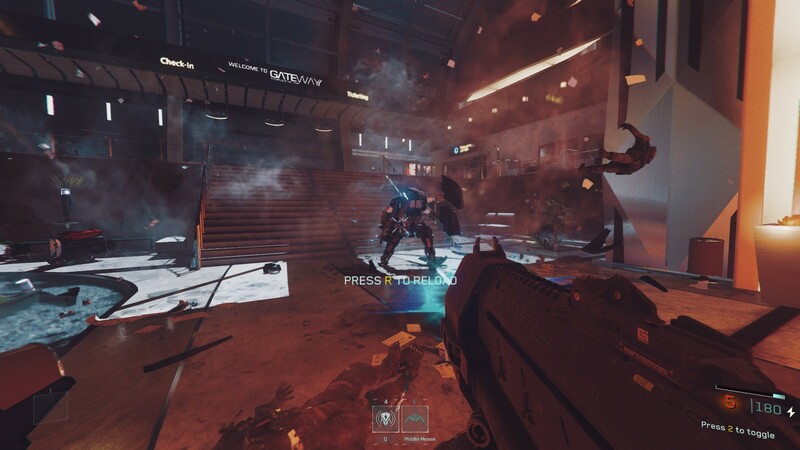 The only memorable bug was that during cutscenes in the campaign, sound effects wouldn’t play on occasion, but otherwise, the game does run and work well. What about the other half of the Legacy package, Modern Warfare Remastered? 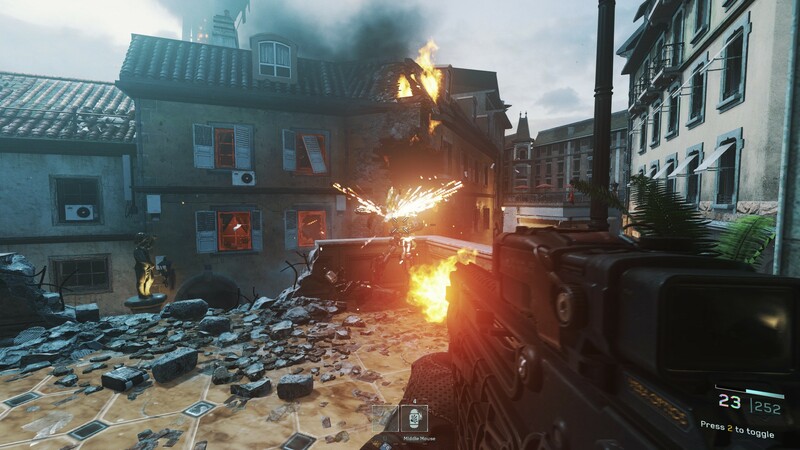 At its core, it’s still Call of Duty 4, the same maps, the same campaign, the same guns. 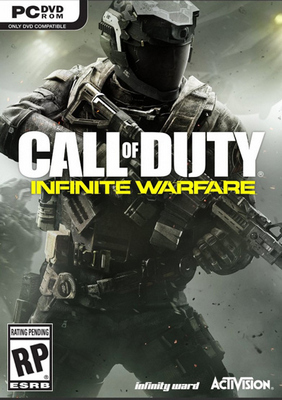 By far the most memorable Call of Duty, you unfortunately get the sense that you’ve seen everything before, provided that you played Call of Duty 4 prior to this release. 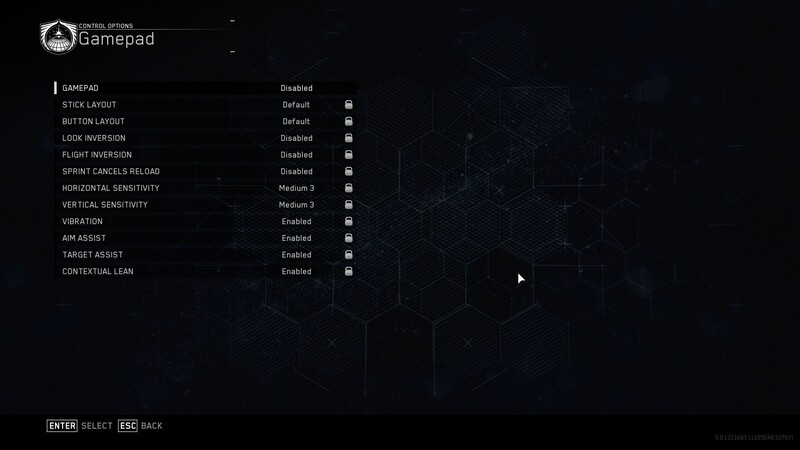 Sure, there’s updated settings, greater graphical fidelity and reworked audio, but as someone who dumped hundreds of hours into the original version on my Xbox 360, after playing through some of the campaign and multiplayer, I was left wondering why I bought the Legacy Edition after all. It’s still a great game, certainly, but I realized that I just wanted something new. 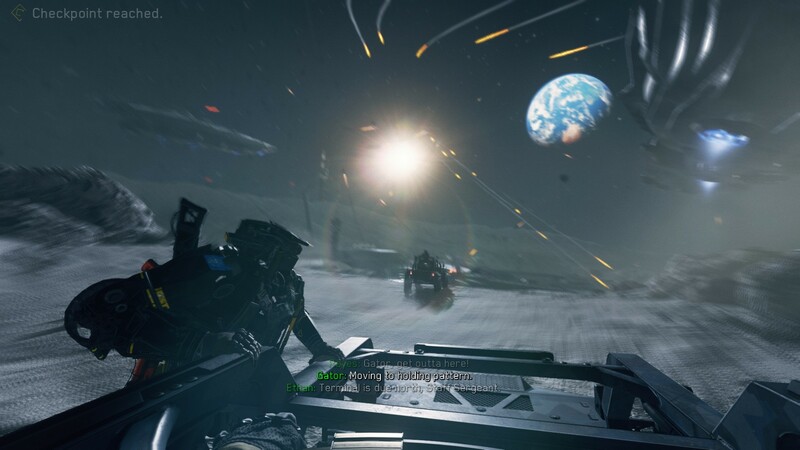 Perhaps there should be some way to link progress between both Infinite Warfare and Modern Warfare Remastered. With two full-fledged games coming in the package, and as someone with limited time to play games, I would have liked there to be some way to progress in both games without having to split my time between them. 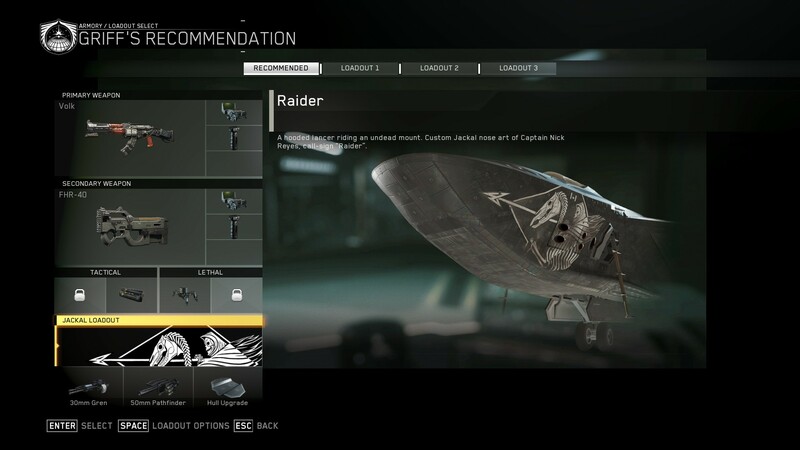 Now, with Modern Warfare Remastered receiving supply drops as well, the two games could conceivably much easier than they were upon release. At the end of the day you just want to play holo-chess. One final note for Modern Warfare Remastered: multiplayer runs extremely terribly. 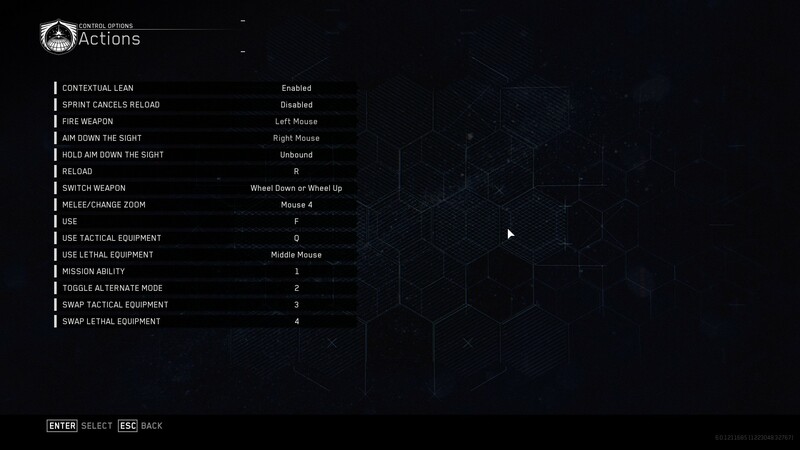 Even on medium to low settings, load times were longer than a minute, I was seeing awful framerate drops, audio was desyncing, and overall performance was laughably poor. It’s definitely not what I expected from a highly anticipated remaster. 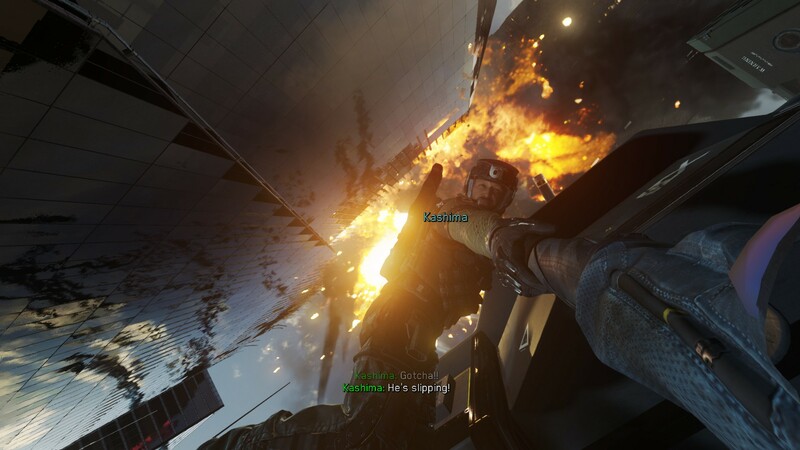 The failings of Modern Warfare Remastered seem to sum up the entire Call of Duty package, in a way: exciting, yet when the new veneer has been worn away, the flaws and imperfections of the surface underneath become glaringly obvious. 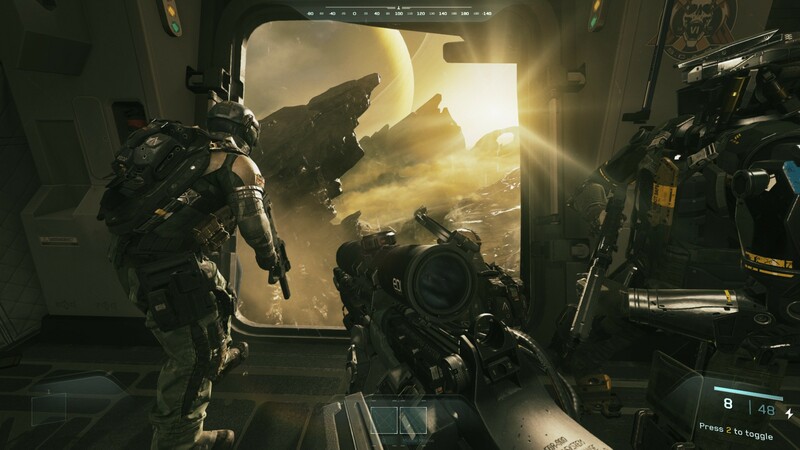 It’s a shame, too, with Battlefield stepping into the past and mostly succeeding, Infinite Warfare was left to compete with the likes of Titanfall for the futuristic shooter market. Yet, the complete package is so miserably mediocre and an unwelcome step back from Black Ops 3, one is left wondering where Call of Duty and Activision go from here. 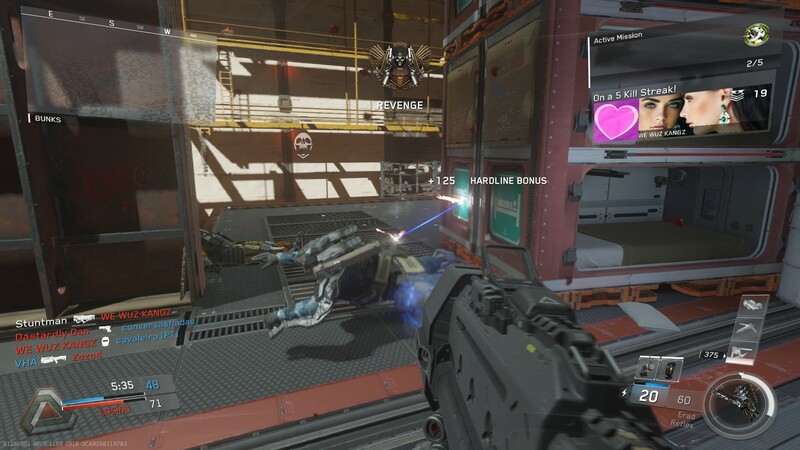 With Infinity Ward releasing the thoroughly boring Ghosts and now this mediocrity, hopefully, that direction is up. A Brighter Tomorrow: Vastly improved storytelling and characters. The Future of Warfare: Gun and equipment designs are original and exciting. Space is…Flat? : Villain characterizations leave much to be desired. 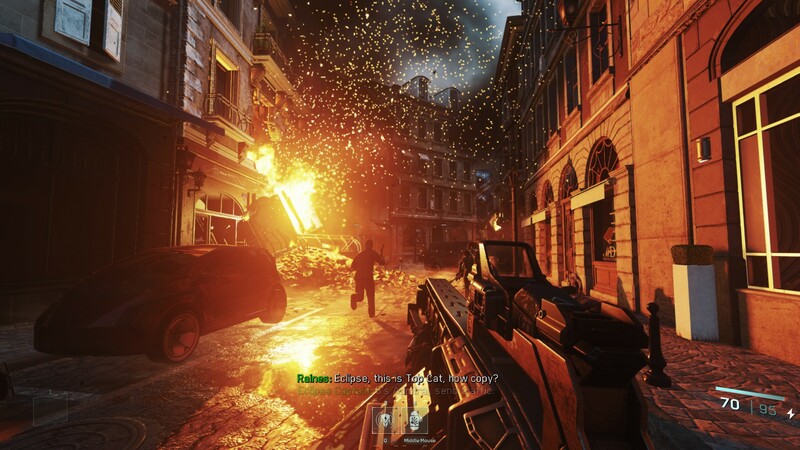 Warfare Retreading: The remaster is nothing new, nor nothing special. Walls? What Walls? : Level design is flat and fails to make good use of movement systems. Boxes of Garbage: Crate system is unnecessarily grindy, personalization feels meaningless. 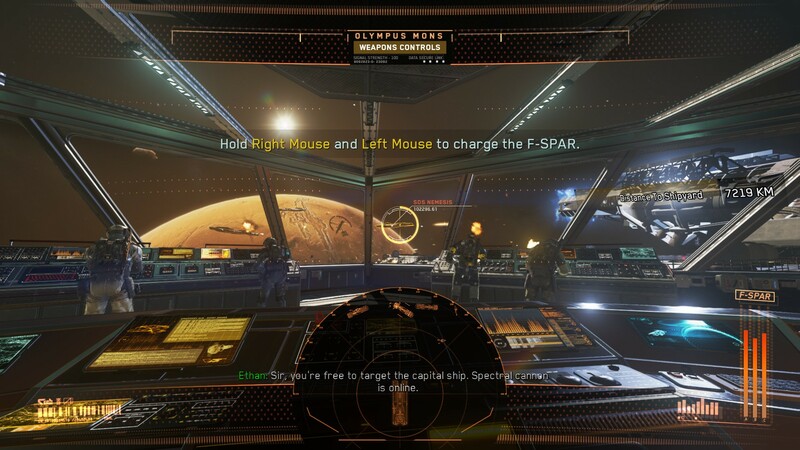 Faster Than Light: Multiplayer moves too quickly to be accessible to many. Time Moves Slowly: Surprisingly poor performance in the remaster’s multiplayer. 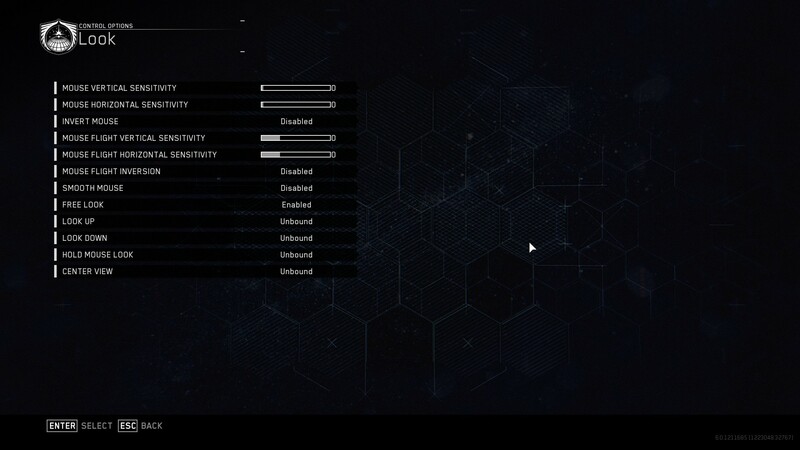 Graphics: Spot shadows, volumetric lighting, ambient occlusion and more all make the rounds for a fairly standard offering of options. 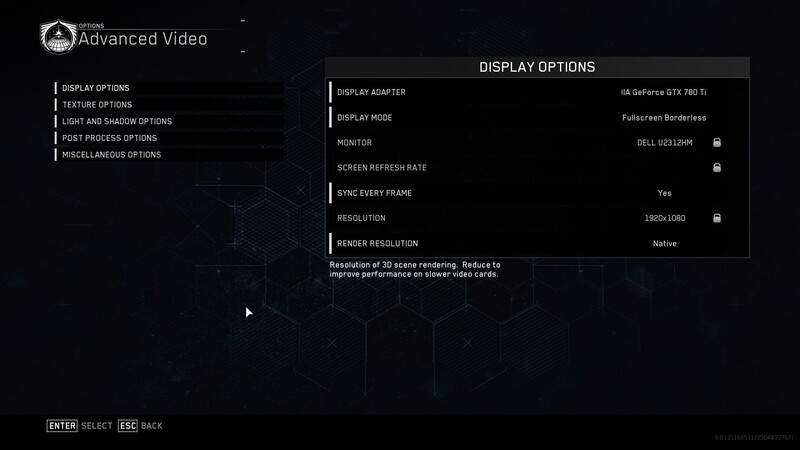 Interesting to note that FOV does go up to 120, and players can set film grain and filmic strength. 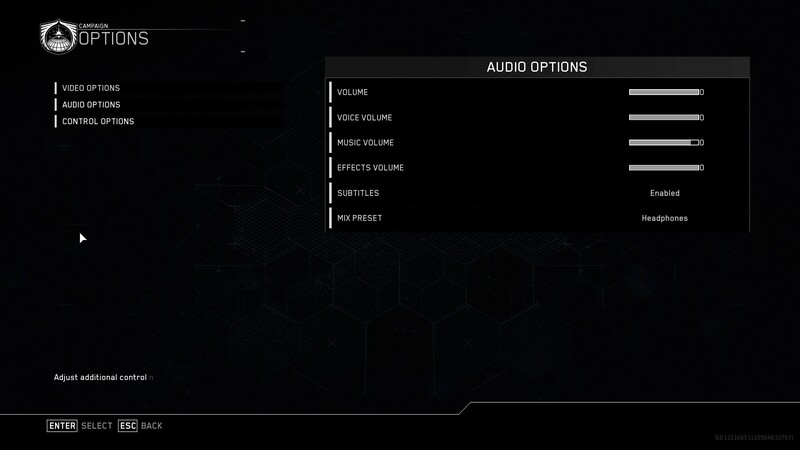 Sound: Four sliders for in-game and VOIP audio, plus a number of output configurations. 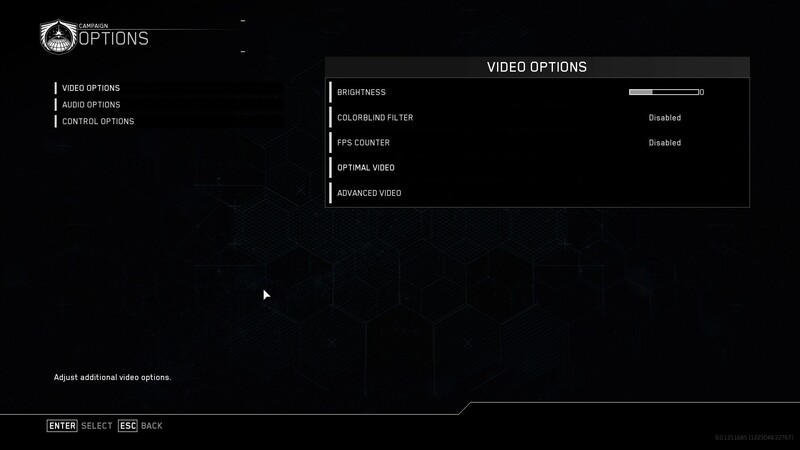 Subtitles are also included, but otherwise, audio options are functional at best. 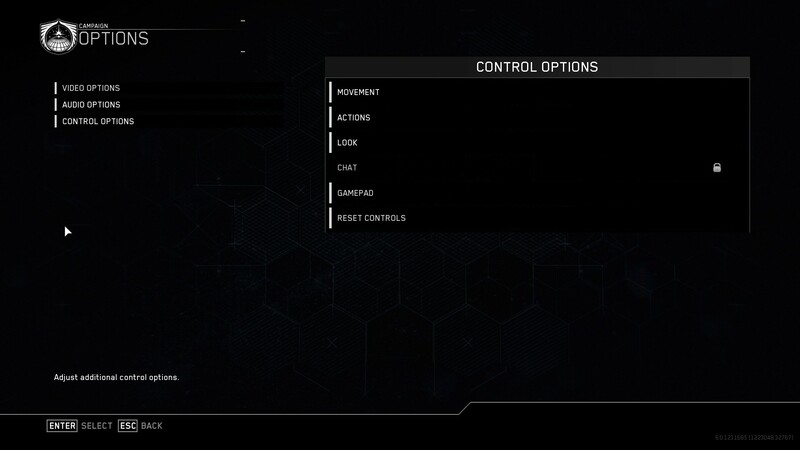 Controls: An impressive number of controls to be rebound, though some are locked to campaign-only flight missions. 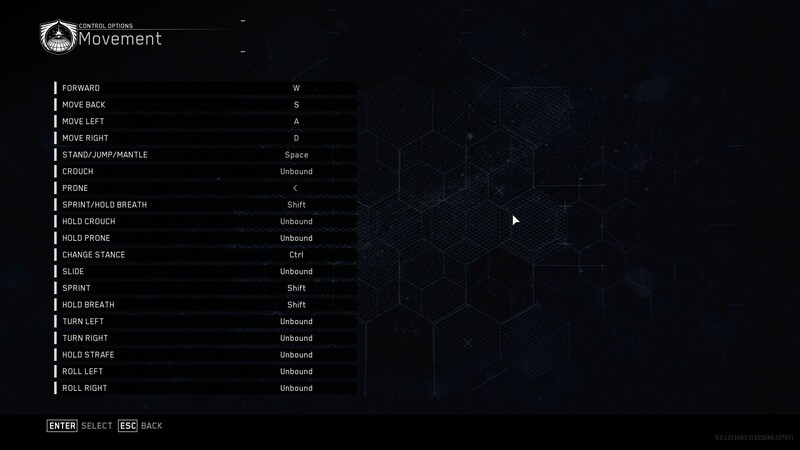 Standard array of controller configurations. 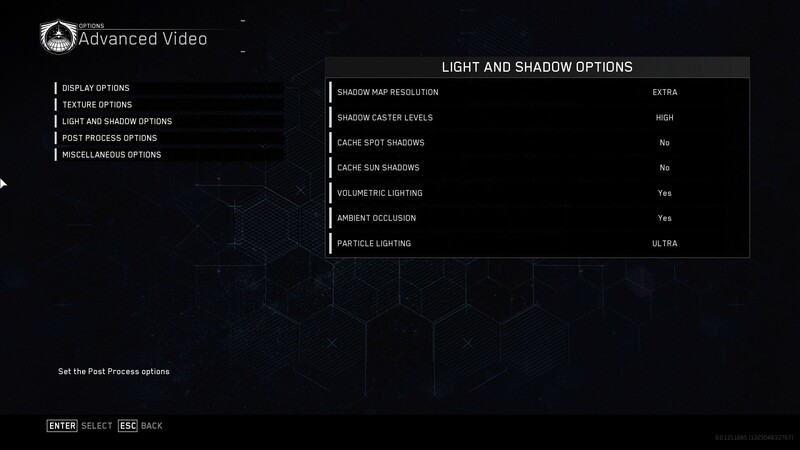 Gameplay: Gameplay options hidden in the controls menu. 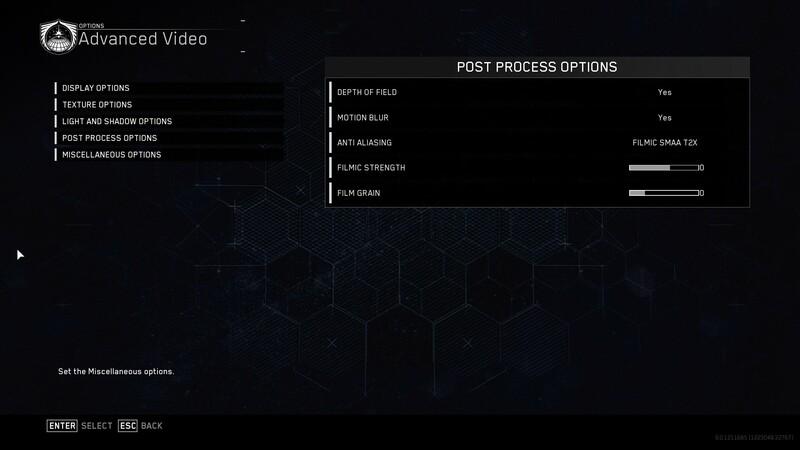 Contextual lean, reload cancel on sprint, and a few options here, otherwise limited array of selections.